City or suburb dwellers frequently decide to build their dream home in the country. They find a nice spot brimming with wildlife and trees. They look forward to waking up to the sound of birds in the morning and seeing hares and pheasants in the yard. But before you can say ‘Where’s my chainsaw?’ they’ve cleared out most of the trees and levelled the land. Within a few years, their driveway’s paved and their lawn looks almost as neat and tidy as the one they left behind in the city. (For my role in this, see Confessions of a Woods Cleaner). They may plant some non-native ornamental trees and bushes and regularly weed their new flower beds. Unfortunately, the hares and frogs have hopped out of the neighborhood as has much of the other wildlife. Does it have to be this way? No, it doesn’t. Wildlife and woods go together. It’s almost impossible to have one without the other. But woods are messy in their natural state, and most humans like to keep their environment looking neat. However, the diversity of native plant and animal life shrinks astoundingly when land is cleared to make way for clean-cut lawns and pristine flower beds. 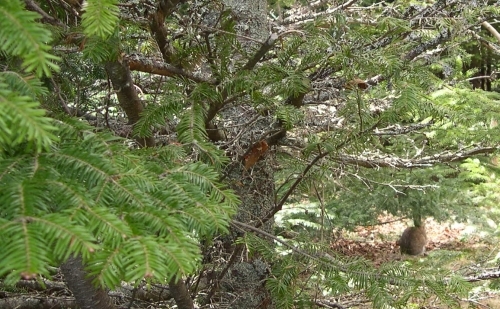 For example, many wild birds, such as woodpeckers, thrive in old growth forests. 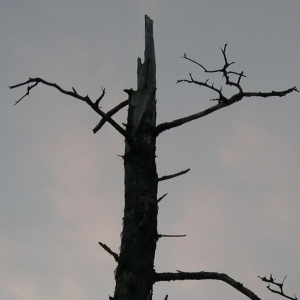 When old trees are cut down, it’s no surprise that the woodpeckers leave the neighborhood. They depend on these old trees for nests and the insect life within them for food. Vernal pools created by toppled trees and an uneven forest floor collect rainwater and provide a habitat for amphibians and a greater variety of plants. (For more information on attracting amphibians back to your yard, see my post on Why Every Princess Needs a Toad in her Garden). The United Nations has designated 2010 as the Year of Biodiversity. You can read more about why biodiversity matters here. If you own land, you might consider leaving some of it in its natural state. One simple solution is to allow wild spaces to thrive on the edge of your property. Allowing the growth of wild hedgerows between properties provides privacy and a wind barrier between neighbors while sustaining native species of both plants and animals. By allowing a wild space to thrive in your yard, you’ll be pleasantly surprised at the diversity of life that it will begin to attract. Excellent article. One of my biggest pet peeves are subdivisions where the roads are named after various flora and fauna that subdivision destroyed by being built there! Not to mention all the people that complain about wildlife such as deer when they move into an area known for the population! Wanderinggrizzly, I haven’t seen roads named after flora and fauna here (yet). Maybe it’s a misconception that people move to the country for the wildlife and scenery. Maybe it’s the cheaper real estate that’s the real draw. great post and i agree. leave the trees alone! if people just want to re-create their city property here in the country, why don’t they just stay there? Conradvisionquest, maybe they just like the process of taming the wilderness. My woods are, um, untidy. I am delighted to learn that all this time I’ve simply been practicing good cooperation with Mama Nature. Thank you, I shall. I popped back in to say congratulations on making The Front Page. You do good work, Amy. that rare beauty of the nature. Jingle, hopefully nature’s beauty will become less rare and more common as people learn how to manage it more lovingly. We live on 10 acres, about 3 of which are wooded and border on two neighbors’ tracts of woods. We simply leave the woods alone. The critters love it, and so do we: good woods make for good neighbors. how very true! They don’t just insulate for noise but also provide that extra visual privacy, even when properties are far apart. For the most part I’ve kept my land the same way I bought it. When I do cut wood for the woodstove, I pick recently damaged trees (wind, ice, etc). Gardenserf, homeowners always think they have to ‘do’ something to their property. Letting things be is seldom considered as an option. Maybe folks fear being labelled lazy for not doing anything. My family moved to the woods from the city 10 yrs. ago. Erosion and invasive plants, like garlic mustard, are a major concern. Of course, I realize that we are an invasive species ourselves that took over the woods, but we’re trying to maintain and be good stewards. Thanks Gloris. Those invasive plants are everywhere these days. I’ve noticed some purple loosestrife in the ditch down the road from here. Being a good steward of the land is often more complicated than one would imagine at first, but being aware of the options is always a good start. congratulations, being on the wordpress homepage, btw! Mia, we don’t have such laws here in Nova Scotia Canada. However, I have read that after five years of decaying on the forest floor, downed trees no longer pose a fire hazard. The last major forest fire that was caused near here was due to carelessness with a campfire. Thought-provoking post and I hope new home owners follow your advice. Slamdunk, I hope so too. Keeping the surrounding trees makes it a bit trickier for the construction equipment to move around the lot, but it’s worth it in the long run. Thank you for your insightful post. The best times I have had in my life has been out alone in the wilderness or playing with my children in Nature. And when I say wilderness,it has truly been wild with no trails just respecting my sense of direction and watching for the odd orange marker. Indeed the wild spaces connect us all together. Since as humans we are part of not separate from Nature. In my work I encourage people all the time to get outside in Nature to reduce their stress. Truly we need to keep the wild spaces as they are great places to be. Perhaps, we will stay in touch. Thanks David. Perhaps feeling connected through nature is the simplest, most direct way for us humans to unwind and reduce stress. Conserving our wild spaces is the kindest thing we can do for ourselves. Great post. Proponents of “smart growth” and “new urbanism” sometimes reduce all the underbrush, and replace native grasses and wildflowers with gravel or concrete. Tom, it’s pretty sad isn’t it? At least if gravel is employed, some weeds manage to grow up in between the stones. Our woods are unkempt but full of wildlife. I dread to think what they’d be like if they were clinically managed. Any civilisation is only as good as it’s woodlands. Think of the cultures who have failed because they neglected this fact. Waging war against nature is un-winnable. Congratulations on making the home page of wordpress.com, Amy! I am so happy you wrote this blog. Over the years (in lean times) we’ve thought of logging our acres in exchange for cash, but we thankfully never did. Although my husband is about ready to murder a pileated woodpecker which pecked a three inch hole in his cedar near the new garage addition. He might not be too keen on woodpeckers for awhile. Kathy, I know that many have had to clear their lands for wood to heat their homes. It’s a tough call sometimes. I have yet to see a pileated woodpecker here but saw them in Ontario. They’re huge and would make quite the racket. The little downy ones here are loud enough already. Not only should you salvage what you can, but you can also restore your suburban lawn with plants native to your area to re-attract that very wildlife! Visit Wild Ones Natural Landscapers for valuable information on how easy it is to do! Thanks for the suggestion julia. Those native plants are going to become a lot more popular in the years to come as gardeners realize that they take much less maintenance and water than non-native species. I live in the woods and I swore this morning that there was nothing more beautiful than the new snow on the trees. I keep redirecting the conversation when my husband talks about clearing the underbrush. I like it all just the way it is! Beautiful pictures, BTW! Thanks Colleen. Glad you agree. Wow Amy-Lynn this post was a real hit ! 50 comments ! WOW ! Really interesting and informative. As always. Guess now I should go back and follow those links. Hello, ‘flandrumhill’. Let me be another visitor from WordPress front page. I don’t live in the woods by any means, but there was an undeveloped land patch nearby with trees and bushes. For 30 years I came to that patch every day and befriended chipmunks, squirrels, skunks (YES!! ), snakes, deer, a moose!, and all types of birds. Then a house went up, the trees & bushes were cleared out, the animals vanished and life isn’t the same. You make excellent points here. KEEP IT UP! Thanks from Ralph, http://draaiorgelfan.wordpress.com, southern New England (RI), USA. Thank you for visiting draaiorgelfan and for your encouraging words. So many neighborhoods seem to lose their vitality once those little patches of wildlife are eliminated. It doesn’t take much to keep that connection with nature: a wild space where berries can be picked, frogs and butterflies can be found and wild flowers can be seen growing. Such a place should be set aside in every residential development. Sadly, the woods the dead end road I live on was cleared a few years ago. 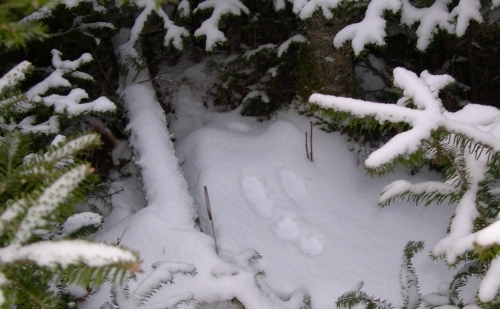 The deer that used to visit me no longer come as those woods gave them shelter during our long winter months. Now, I have more noise and light pollution from the homes and streets that have been built where once a thriving woodland community lived. I miss those woods. Scott, that’s such a shame. Of course you would miss them. 😦 It’s amazing how much the woods can buffer noise. The light pollution would also prevent you from seeing most of the stars at night. Trees and vines march right up to the fence. A flotilla of flowers in a sea of green. And she’ll take back this garden like yesterday’s snow. We are grateful to do it, for Her letting us stay. That was written at my old house. I again live in the woods but my “lawn” is mostly moss. I work for the largest US environmental conservation organization and we partner with the many smaller organizations who help folks keep their woodlots. 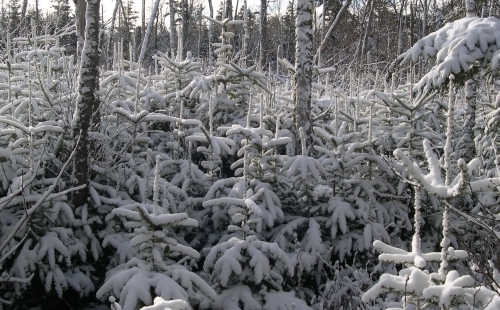 Many folks have woodlots and don’t have a clue as to how to make the most of them. What a helpful service your organization is providing. A big ‘yahoo’ to you, too, Miss Amy Lynn! At times, you move me with the beauty and wisdom of your words and at other times, you rile up my righteous anger on behalf of nature. You always make me think more deeply about the world around me, its effect on me and my effect on it. I hated living in Florida for this very reason…it seemed that no one cared a bit for the landscapes and wildlife…just clear it all away. It really was so sad. Thanks for bringing the issue to light. Millhill, Florida’s wild spaces would be so beautiful given the colorful variety of wildlife there. It would be so disheartening to see its demise. The dollar is too often the bottom line. We have 7 acres…about half of it hillside. It is difficult to walk through them at times because of all the underbrush…but we do have some wildlife. We have a creek and a meadow that was already “clear”. So…in a way…we have the best of both worlds. An open area and a wooded area. Unfortunately…years ago…a previous owner pretty much clear cut all of the area, so there aren’t many old growth trees. Abigail, it takes more than just a couple of decades to replace those old growth trees, but the underbrush seems to grow pretty fast. Pepsoid, yes, the exposure on WordPress’ front page was quite a gift. Keeping nature wild seems so obvious to some of us – yet I’m sure it seems radical to those who would feel more comfortable with everything tamed and civilized.